Sonic Drive In on Main Street in Birch Run. A few weeks ago, I put up a press release about Sonic opening a store in Birch Run. I knew it was just a matter of time before we would find an excuse to make the trip east. The Sonic in Birch Run is the chain’s fifth Michigan store. It’s located on Main Street in front of the Prime Outlets. You can see it as soon as you get off the Interstate. The store has an exit and entrance from Main Street which was actually closed off when we first went by because of a lot of traffic, but most people will actually enter off Beyer Road in the back. When we took a trip to Flint just a few weeks after the Sonic opening there, we actually had to wait in a line to get a stall. I assumed the same thing would happen in Birch Run. (Oklahoma City) – Birch Run residents now have a reason to stay in – stay in their cars that is. 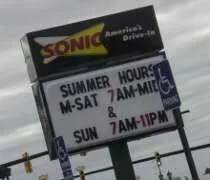 SONIC®, America’s Drive-In®, a restaurant where you order your meal and eat right from the comfort of your own vehicle, opened its first drive-in in Birch Run. The Birch Run SONIC Drive-In is located at 8650 Main Street, and officially opens at 7 a.m. on Monday, July 27, to serve customers. With the full menu available all day, customers can enjoy a Breakfast Burrito to start their morning or as a late night snack. The new SONIC will feature 28 drive-in stalls, two patio ordering stations and a drive-thru. Tony’s in Birch Run to be on Triple D? 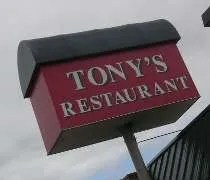 Frequent commenter Dan pointed me to an article in the Saginaw News that says Tony’s Restaurant in Birch Run may be featured on my favorite show Diner’s, Drive-In’s, and Dives. Fritzler said producers contacted him about three months ago and indicated they wanted to tape this summer. On the day of filming, posted notices will warn patrons not to enter if they don’t want to appear on TV. A representative from show producer Page Productions of Minneapolis, Minn., would not confirm whether taping would take place. Tony’s was one of the places I wanted to stop when we took a trip to Frankenmuth last fall, but I wasn’t sure if it was a place my parents would enjoy. It definitely sounds like a place J and I would enjoy and it’s now getting bumped up to a higher priority on our list of stops.